As shareholders of Swiss pharmaceutical company Novartis meet today in Basel, Switzerland, the international medical humanitarian organisation Médecins Sans Frontières MSF (Doctors Without Borders) called on shareholders to urge the company to drop its ongoing court case against the Indian government. MSF is concerned that the case could have a severe impact on access to affordable medicines for people across the developing world. The hearing is scheduled to take place before India’s Supreme Court in March, and India’s Attorney General has just been appointed to defend the case for the government. Novartis first sued the Indian government in 2006, after a patent the company was seeking for the cancer drug imatinib mesylate was rejected. India grants product patents in line with international trade rules since 2005, but in the interest of public health, India’s law is strict about what does and does not deserve a patent. Patents are not granted on modifications of drugs that already exist. Because Imatinib mesylate was the salt form of imatinib, the original invention behind the cancer drug, it was not granted a patent. 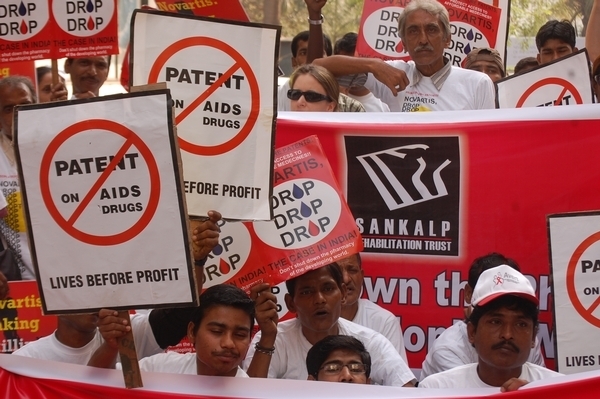 Since then, Novartis has been attacking this part of India’s patents law – called Section 3(d) - in the courts. After losing a legal battle to have Section 3(d) removed from India’s patent law in 2007, the company is now trying a new legal tactic to weaken it. A Novartis win will lead to Indian patent offices granting patents on modifications to drugs which would otherwise remain off-patent in India. This would take the substance out of a public health provision which has already demonstrated its importance in securing affordable access to key HIV, TB and cancer medicines. MSF has launched a Stop Novartis social media campaign to draw attention to the implications of the case and to call on the company to back down. Alongside other civil society organisations including Act Up, Oxfam and the Berne Declaration, MSF is protesting against the company’s actions outside the shareholder meeting in Basel and outside of Novartis headquarters in New York. Generic medicines produced in India make up 80% of the HIV drugs MSF uses to treat 170,000 people in 19 countries.